The 7T59 calibre lived a short, but glorious, life from 1991 to 1993 and is still, in the analog watch world, one of the most complicated movement manufactured for the consumer grade segment. There is a school of thoughts that Seiko's own 7A28/38 is a superior movement, but let's not forget that the 7T59 is, to this day, the only analog 1/100th second chronograph offering day + date + GMT functions. Nothing in the current Seiko range of Coutura, Sportura, Premier, and even Velatura, offers as much. Nor can we find any watch like that in the catalogues of other brands. Seiko Japan said that they manufactured the 7T59 to prove to the world it could be done. The reason they gave to explain the end of production was that digital watches had become all the rage and could offer the same functions for a lot less money. It is true that, for its days, the 7T59 range was expensive, with typical street prices between $750 and $1000, and over, depending on the model. If we calculate the cost of purchasing a 7T59 in constant US Dollars over 20 years, the introductory price of $2200 for the Masterpiece in 1992 would equate to $3500 in 2012. 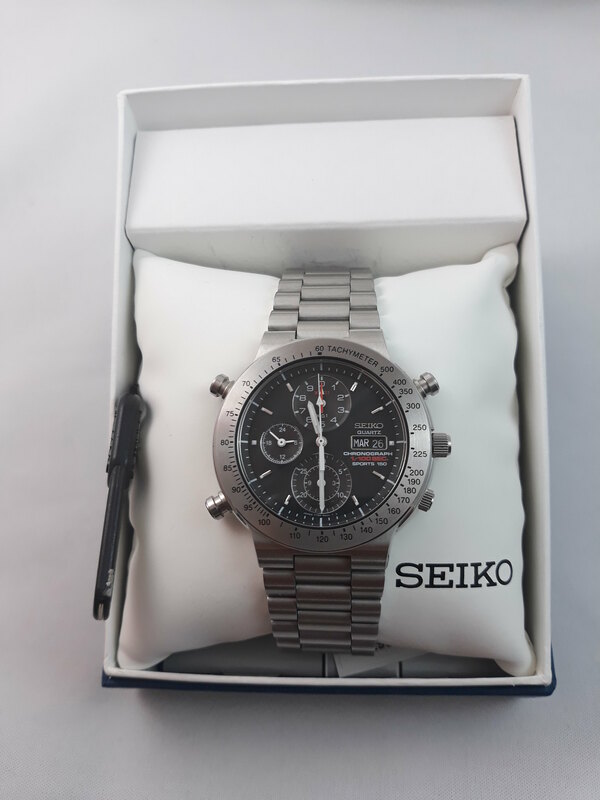 In the current Seiko range, this price is about the same as the RRP for the Ananta automatic chronograph, model SRQ005J1, with its calibre 8R24. Not cheap indeed. We can assume that development costs had been such that Seiko needed a high RRP to recover their costs. The 7T59s are also linked to the Olympics of 1992. At the Barcelona Summer games, Seiko was the official timekeeper and ran an advertising campaign to showcase the 1/100th second chronograph technology alongside the need for accuracy of Olympic events (see the Media/Adverts section). 1. World's very first 1/100th second quartz chronographs. 2. Only produced from very late 1991 thru to early 1993, a short run for Seiko models. (other than digital watches) by any manufacturer. 4. Never marketed or sold in the USA. 5. There has never been anything like them before or since in the analog watch world. 6. Have you seen the dance of the 10th and 100th second hands? Truly mesmerizing!